'Beautiful Qirya' project launched in Jewish Quarter of the Old City of Jerusalem. 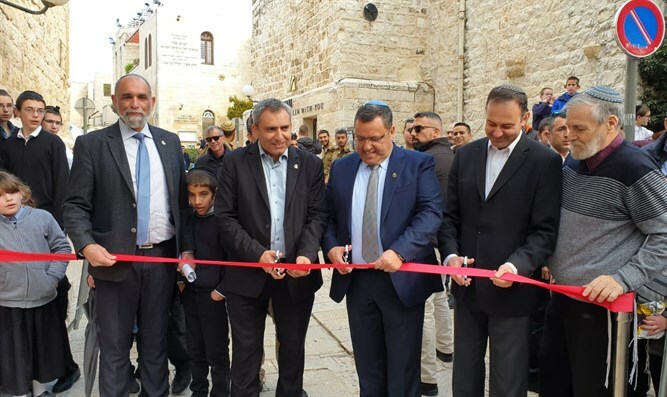 Jerusalem Affairs Minister Ze'ev Elkin and Mayor Moshe Leon took part Sunday in the unveiling ceremony of the "Beautiful Kirya" project in the Jewish Quarter of Jerusalem and at the launch ceremony of the new project in the Burnt House. The Jewish Quarter Development Company is working to renovate the Quarter and to invest in projects that are in various stages of work, including the Western Wall Elevator, the beautiful Kirya, the Revival Park, the Herodian Quarter Museum, the Burnt House, the Great Wall and the Jerusalem Mosaics Project. "We, as the Jerusalem and Heritage Office, are proud to take part in the process of renewal of the Jewish Quarter," Elkin said at the event. "We operate in all parts of the Old City - by making roads accessible to tourists, improving the streets and strengthening Israeli sovereignty, and now we have reached the jewel in the crown - the Jewish Quarter." "The Jewish Quarter is the jewel of the Old City and it is time that this section be more beautiful," Elkin said. "I am proud to have had the privilege of making the strategic decision to bring the Jewish Quarter into our work plans. We will continue to push and support projects in the Jewish Quarter and throughout the Old City." Mayor Moshe Leon said "in spite of everything that the Jewish people have gone through, we have returned here. The children of Jerusalem play here. We will do everything in order to preserve the present, to remember the past, and to work for the future. The future of our children is here in the Jewish Quarter, in Jerusalem and in Israel." Herzl Ben Ari, the CEO of the Jewish Quarter Development Company, said: "I hope that anyone who reaches the Jewish quarter in Jerusalem will feel that we have fulfilled his dream and that every guest and tourist from all over the world will feel the uniqueness and the eternal values ​​of the capital of Israel."